UNITED NATIONS, March 25 -- While the UN's Ban Ki-moon is said by his advisors to be close to announcing a visit to Myanmar, as early as next month's ASEAN meeting, with U.S. support, the situation in Myanmar, particularly for minorities like the Rohingya and the Karen people, continues to deteriorate. Meanwhile, at the US State Department on March 25, a visit to Myanmar by one US official named Brown was denied, while another was confirmed but downplayed. A rapprochement appears to be afoot, not based on any human rights improvement by the Than Shwe military regime, but out of lack of imagination or hunger for natural gas. Inner City Press: On Myanmar, the UN’s working group on arbitrary detention has said that the imprisonment of Daw Aung San Suu Kyi violates not only international law, but also Myanmar domestic law. And there is also a report in The Times of London about villages being laid to waste in the Karen areas of the country. Is this something that either Mr. [Ibrahim] Gambari or Ban Ki-moon as Secretary-General is looking at in advance of a possible visit to the country? Associate Spokesperson Farhan Haq: Well, the Secretary-General and Mr. Gambari are certainly aware of this report. Obviously the report speaks for itself and you can get it through the website of the Office for the High Commissioner for Human Rights. As for a visit by the Secretary-General, nothing has changed in terms of what we’ve said. There is no visit planned at this stage. While this final statement may technically be true, a senior UN official happily told Inner City Press that the visit will happen, and named April 18 at as the likely date. 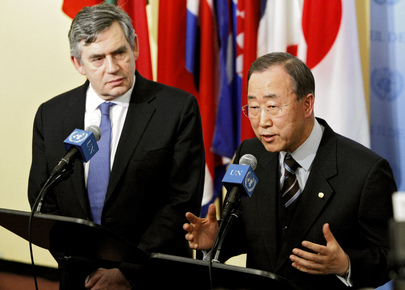 Following UN Secretary General Ban Ki-moon's meeting with the UK's Gordon Brown on March 25, Ban said that Myanmar was one of four country conflicts they discussed. The others were Sudan, Afghanistan and Sri Lanka. Brown offered some specifics on Sudan and Afghanistan, but nothing on Sri Lanka or Myanmar. Afterwards, Inner City Press asked the UK Mission spokesman for a read out of the meeting as regards Myanmar, which will be reported on this site upon receipt. UN's Ban and UK's Brown: talked Myanmar, but about what? QUESTION: Can you confirm that a U.S. official met with Burmese officials in Burma yesterday, and that is a sign of softening of the U.S. position on Burma? Acting Deputy Department Spokesman, Gordon Duguid: No, I will not confirm that because it’s not correct. I did see that this was a report on a blog. I’ve been directly in touch with the officials that the blog named, and there was no contact that either official recalls, let alone sought out. So the report is incorrect. QUESTION: So it’s incorrect to say that the – Mr. Blake [Ambassador Robert O. Blake] met with the Burmese Government? MR. DUGUID: It is incorrect. QUESTION: Okay. And – but is it correct to say that he was in Burma, was in Myanmar? MR. DUGUID: In what time period? I believe he has visited Burma once in the past. He has not, however, had any substantive conversations with Burmese officials, nor has the U.S. position on Burma changed. QUESTION: If you say it’s not substantive, what does that mean? Does that mean he’s had other, less substantive conversations? MR. DUGUID: As all diplomats know, if you go to a reception and the host has invited someone else, you may in that setting come across someone from a – in this case, the Burmese Government. The ambassador has no recollection of that happening. MR. DUGUID: But that is a possibility at some point in the future, of course. QUESTION: When he last visited Burma? You said he visited there recent past. MR. DUGUID: I did not say the recent past. I said at some point in the past. I don’t have that – those dates for you. I do believe he has been to Burma at some time in the past. I don’t think it’s relevant to this particular question. Question: Can you confirm that a U.S. official (U.S. Ambassador to Sri Lanka, Robert Blake) met with Burmese officials in Burma yesterday and does this represent a softening in policy towards Burma? Answer: No. As the Acting Deputy Spokesman said at today’s Daily Press Briefing, Ambassador Robert Blake did not meet with Burmese officials yesterday. However, Stephen Blake, the Director of the Office for Mainland Southeast Asia at the State Department went to Burma as part of a five-country tour of the countries that fall under his office: Burma, Cambodia, Laos, Thailand, and Vietnam. In Burma, Mr. Blake met with a variety of people representing a wide range of views regarding the current situation, including Foreign Minister Nyan Win, other members of the Burmese government, members of ethnic minority groups, and members of the National League for Democracy’s Central Executive Committee (aka “The Uncles”). His visit does not reflect a change in policy or approach to Burma; Office Director-level officials, including Mr. Blake’s two immediate predecessors, have visited Burma and met with Burmese officials on a number of occasions in recent years. The Burma policy review announced by Secretary Clinton is still underway. While we have not yet finalized our approach, we remain committed to encouraging a genuine dialogue between the Burmese authorities and opposition that leads to a free and democratic Burma that respects the rights of its diverse citizens and is at peace with its neighbors. Inner City Press: in the last 24 hours, Myanmar has arrested five more democracy activists. Meanwhile, at least it’s said from United Nations officials that Ban Ki-moon is considering visiting in and around the ASEAN summit. First, is there any response to these more recent arrests of democracy activists? And two, what are the standards that Ban Ki-moon is going to use for visiting Myanmar or not, and does he plan to go on 18 April? Deputy Spokesperson Marie Okabe: I have nothing to announce in terms of any visits today. In terms of the Secretary-General -- the criteria are spelled and nothing has changed on that as well. As for the immediate comments to today’s arrests, his Adviser, Mr. Gambari, has been very clear on the subject of arrests. How about clarity about the Karen people or on the questions raised about how the Myanmar Constitution's reservation of 25% of seats for people of "military background" not only would make it still a military government, but also excludes women, based on non-attendance at the two military academies in Myanmar which would give the required "military background"?